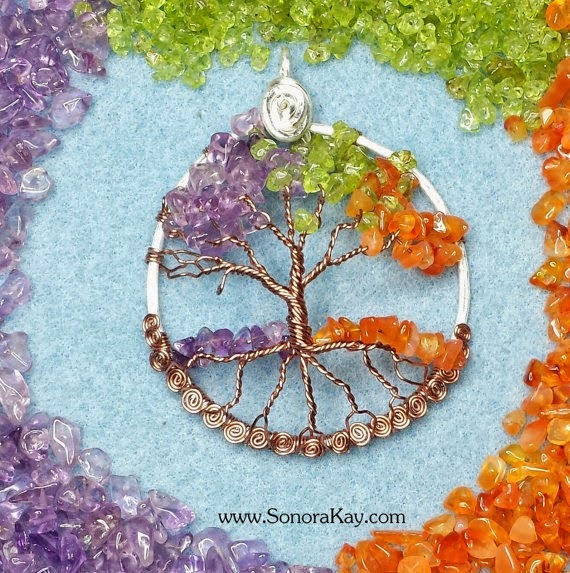 Welcome to Sonora Kay Creations! You get the benefit of working one on one with me, to create that perfect One Of A Kind custom piece of fashion jewelry that will not be found elsewhere. I have been designing and creating beautiful things for as long as I can remember. In my teens I made plant hangers, wreaths, silk flower baskets, cloth boxes and more. I had a lot of fun with my glue gun in those days. In my 20's I got into weaving and jewelry making and it has evolved from there. I thoroughly love to create, either my design, or yours. It is where and when I feel most at peace. I also have a deep love of nature, and when I am not creating inside, I can be found in my garden I refer to as My Little Utopia! I have a section in my shop titled Breast Cancer Awareness. 75% of the sales from this section will be going to support my Sister Meg a breast cancer survivor who was left deeply in debt from her battle, and is still in need of help. Should you wish to purchase from another section, but would like the funds to go to Help Meg, please write HELP MEG in Note to Seller when making purchase. I am a proud, and active, member of SRAJD! The International Organization for Self-Representing Artists in Jewelry Design. Do you have a favorite piece of fashion jewelry in need of repair? Contact me to see if it is something I can fix (pictures help a lot!) and if so I can make up a repair listing for you. Most repairs are $20, such as restringing necklaces, bracelets, and such. Hand knotting pearls is $4 an inch. All works and repairs are completed, and shipped from a SMOKE FREE environment; it is however, not a pet free. I have 2 dogs and a cat, so if you have allergies let me know, and your work can be created and shipped from another location. I do have access to a pet free location where I can create and ship your order from. I just need to know ahead of time. All jewelry is sealed in plastic as soon as it is made, and given a cleaning prior to shipment, if it has been in inventory for a while.